Green Sweep was established in 2006 by a local Guelph resident who had worked for other ‘mainstream’ cleaning services and found the harsh chemicals used in traditional cleaning products that we buy at the store – were making her sick. With growing sensitivity and awareness of the dangerous chemicals many of us use every day – on surfaces we use for bathing, eating, and sleeping – she saw a possible niche and decided she could do it a different, and better way. She was right – there was lots of demand for a locally owned, completely green, cleaning company – and Green Sweep has grown ever since. In 2013 a change of ownership saw the company re-registered as Green Sweep Canada and we’ve continued to grow, with around 200 commercial and residential clients across a wide geographical area. We have high staff retention and high customer retention – our goal is to sustain an environmentally and socially responsible company. To that end, staff are paid higher than the industry average and are compensated fairly for the very hard work they do. We work as a team, and occasionally play as a team too! Clients notice that staff go out of their way to deliver hands-on and personal customer service. I’ve had the pleasure of using Green Sweep's service monthly for several years and I’m pleased as punch with the results every time. The staff are lovely and my home feels fresh and clean without the use of nasty chemicals. Highly recommend. Part of what i like about greensweep is the excellent communication and professional approach. that's what we've always lacked with housecleaning services. 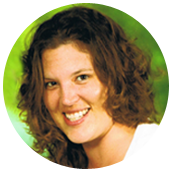 Jessie Baynham spent 15 years developing a professional career in mental health, community development & education and organizational management/administration in the non-profit environment. After several years spent in high stress executive management positions, she decided to listen to intuition and make the difficult, but ultimately wise decision to leave that world and find a healthier, happier way to work and live. Along with some other part time work, Jessie started working as a cleaner with Green Sweep in the fall of 2012 as part of a personal and professional ‘re-set’ time. To her pleasure (and surprise! ), she fell in love with the business and the work - finding it satisfying, and rewarding! Jessie purchased Green Sweep in August 2013 and is happy to continue improving on an already strong company! In addition to her appreciation for the work itself, Jessie and her family are passionate about the environment and the health of the world around us. She feels confident and proud, knowing that the products Green Sweep uses with clients are the same safe products she uses in her own home. Jessie lives with her daughter in Guelph. © 2014 Green Sweep Canada. All rights reserved.